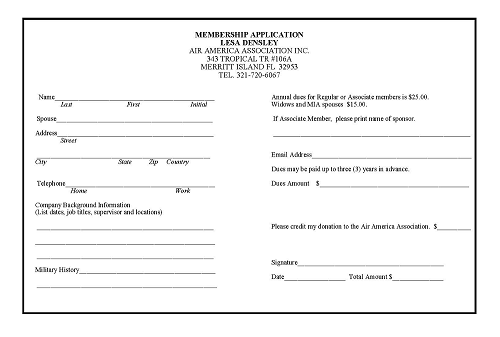 Regular membership is open to all former employees of Civil Air Transport, Air America, Air Asia, which are entities of the Pacific Corporation, and Southern Air Transport Pacific Division, including their spouse, former spouse, widows, or widower, children, grandchildren, and great-grandchildren with continued succession. Membership requires dues be paid up to date, and those in arrears are no longer members and do not have privileges. Former spouses of former employees of any entity above must pay dues to retain membership. A former spouse keeps their privileges if they remarry and pay their dues. The new spouse of a former spouse does not have membership privileges, and that includes voting on any issue or election. Widows or widowers retain their privileges at reduced rates even if they remarry, but their new spouse does not have membership privileges. A widow or widower who remarries a former employee is not required to pay dues and has the same rights as a spouse. Eligible children, grandchildren, and great-grandchildren must pay dues to have membership privileges, and membership is not required by the parents. The Association assumes these offspring are the product of both parents whether they are adopted or not, and whether the child is the natural child of either the mother or father. The parent is required to verify, and if the parent is not available, the applicate must show proof they are the child of the parent with a birth certificate, adoption paper, or some other document proving parentage. Spouses of children, grandchildren, and great-grandchildren have the same rights as first generation eligible members. The rules above concerning divorce and death of the eligible member apply to them equally. The dues exemption for regular honorary recipients does not extend to their widows and widowers. They must pay dues at reduced rates just like any other widow or widower to continue membership. Associate membership is open to the employee’s other family members. Also eligible are persons in other organizations, civilian or military, who supported or backed any Pacific Corporation entity in Asia during the years 1950 to 1975. A regular member must sponsor associate members who will vouch for and provide proof of support or backing. Membership acceptance for regular and associate requires majority approval by the Board of Directors.